Sometimes in January 2014, Ben Bernanke will leave the job of America's key central banker. The replacement is already being looked for. According to polls, current Fed vice-president Janet Yellen (picture below) and ex-Harvard president Larry Summers are the two frontrunners. Arguments in favor of both are so asymmetric that I won't try to compare them. Needless to say, I know Larry in person and we've been on the same side of a battle for some fundamental values at Harvard so his candidacy for the most important economist's job in the world is far more interesting for me than Yellen's. Despite all complaints I could possibly find, I am obviously his supporter. At the same moment, they have a similar background – they're connected with the universities, the Clinton administration, and they're equally Jewish, too. Alan Greenspan has made that job really influential. It's fun but I don't really think it is such a healthy fact. Ben Bernanke said something on June 20th and the markets saw the greatest drop in two years or so. One question is whether the market participants' reaction was rational. In this case, I tend to answer Yes because similar indications that the stimuli will be abandoned sooner than thought do mean that the equities are less valuable than what you thought a minute ago. In many other cases, I believe that the investors' reactions are utterly irrational. But even if they're rational, it's a completely different question to ask whether they're constructive for the economy. I think that prices of things – at least most of them – play a very important role because they quantify the utility and help to allocate the resources to the most profitable places – to places that ultimately bring the optimum "happiness" to the people. Prices, at least not most of the numbers encoded in the prices, shouldn't reflect the mood of a Fed official on a sunny day, his or her breakfast, or whether or not he or she says exactly what he or she means. ;-) They should also not be slaves of the stupid and ignorant investors' group think and mass hysteria but I am not sure whether the Fed officials can cure this particular disease. I feel that central banks' policies should probably be much more automatic and prescribed than they are – mostly based on some targeting that may take inflation, GDP growth, and even market indices into account – the targeting should attempt to send some combination of these factors (not necessarily all of them) grow at a predetermined nominal rate. Clearly, this isn't the case in the U.S. where it is normal for the Fed chief to use the argument about the "support of the economy" in rather arbitrary ways to justify whatever he or she needs to do or at least wants to do. This gives the Fed chief a lot of power and this absence of trusted targeting policies is the primordial reason why the words by the Fed chiefs (and even former Fed chiefs) have the ability to drink trillions of dollars out of the equity markets within hours, and so on. Taking this observation as a fact, it's another question what the candidates might be expected to do, whether it is a good thing or a bad thing, and how it follows from their (claimed and real) successes and failures of the past. The pundits obviously disagree what is good and what is bad about the actions of the candidates in the past. It's really Summers' past that ignites much more detailed discussions because Yellen hasn't done that much. She's a typical "candidate that irritates almost no one", a negative candidate who wins if the "positive candidate" who really makes people interested, namely Larry Summers in this case, collects more negative than positive votes. She's running as the non-Summers here. I think that Summers is a very good economist although I am annoyed by some of his big-government, Keynesian, excessive-stimulus, pro-bailout, borderline arrogant socialist proclamations in recent years. However, I would still admit that the huge bailouts he participated in, however misguided, haven't caused any genuine serious problems and they have probably improved many things and protected the world economy from many unpleasant consequences. In fact, if something really bad happens now, I would find it unlikely that it could be attributed to the stimuli that peaked a few years ago. But Summers isn't "primarily" a big-government economist for me. He's primarily an advocate of the free markets, deregulation, rational allocation of resources and services, a defender of financial institutions and their right to offer complex financial products, and many other things – and those are more important factors that turn him into a warrior on the right side. Various criticisms such as this one in Money Morning are completely misguided. I still remember him as an economist in the Clinton years (the late 1990s) in which I thought that the Democrats and Republicans were equally acceptable to me – two faces of America that always works. Needless to say, this is not how I see American politics today. It was right and important for Summers to send a memo pointing out that the third world is heavily underpolluted which means that some comparative advantages they possess are insufficiently exploited. It was right for him to promote the dissolution of the artificial boundary between the investment banks and commercial banks. It was right for him to promote the free trade with other countries at various points. And it was also right for him to fight against too big deficits, at least some years ago when he did so. I could write many paragraphs explaining why regulation generally makes things less efficient, why arbitrary bans saying that this company can't do this or that only make it harder and less efficient but the activity ultimately materializes in some way, anyway. I could write essays about the free trade that ultimately helps everyone. I could be explaining why regulators can't be wiser than the actual players in the financial sector. But those who dislike these principles won't listen, anyway. Also, I believe that Summers is the self-confident enough man who wouldn't be afraid to tighten the policy if it became necessary. Right now, he seems to be an outspoken supporter of quantitative easing and so on which is not hard to understand if the U.S. borrows the money just for 2 percent and something. However, if the yields substantially increased, I am confident that he would change his attitude to an anti-debt person again (although, as a Fed chief, he wouldn't say too much about the fiscal policies). And if the inflation started to run high, possibly out of control, he would quickly morph into an anti-inflation fighter. 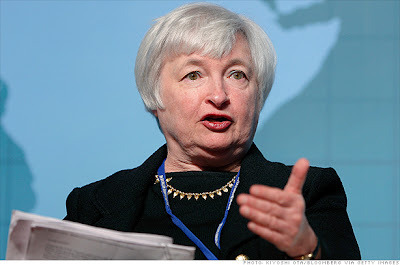 I don't know whether those things are true for Yellen because my knowledge of her is infinitesimal. But I just think that the absence of knowledge isn't a good enough background for making someone the most powerful economist in the world so I couldn't recommend her at this moment even though she could be perfectly competent. arbitrary ways to justify whatever he or she needs to do or at least wants to do. It may be true that Fed behavior is less automatic than it should be, but I wonder if you're basing your remark in part on what Fed chiefs say to Congress. I think almost all members of Congress are clueless when it comes to economics, and the Fed chiefs probably take this into account, competently or not. As for inflation: Last I knew, most of the debt is short- and medium-term. (This was the result of a decades-long project to make it that way.) So there's a huge amount of rolling over, and this means that were interest rates to rise by much, we'd be in trouble very quickly. Well, the short- and medium-term interest rates may evolve independently of one another and of the long-term ones. You always have some time to adjust to the change of the short-term etc. interest rates. As long as they substantially change in timeframes longer than the time for which you borrow, it's time to adapt while the only "negative" consequence is to shrink the consumption that depends on the debt which is not such a bad thing. The responsibilities of the Federal Reserve Bank go beyond optimizing economic growth and stability; purely social factors are included by law. The Federal Reserve Act was amended forty years ago to include the duty to “-promote effectively the goals of maximum employment, stable prices, and moderate long-term interest rates-“. Dear Gene, interesting to know, thanks. I know that America has survived those 40 years just OK but that can't stop me from seeing this description of the work as a socialist one in character, especially because of the worshiping of the low unemployment (unemployment is damn important in the economy) - and one that gives them almost arbitrary powers as long as they argue that those things will be improved. It does appear that the Federal Reserve Act includes conflicting requirements but the question is “Can we kick the can down the road indefinitely?” Maybe there is some kind of catharsis in the US future. The Fed does not operate quite independently of Washington politics, naturally. Lubos - The author of that voices.yahoo article, Morgan Drake Eckstein, is a "Third Degree Wiccan and Adept Major (6=5)," writes favorably about astrology, and has written a book "Five Reasons Why Magic Fails," which says that the failures are due to mistakes by the practitioner. LOL, very amusing or embarrassing, still, the article about the unemployment is perfectly sensible. I may quote lots of other sensible articles with a similar message written by people not discredited by magic or whatever but I won't do it because unlike the hypocritical morally inferior and corrupt bulk of the mankind, I judge texts by their merit. I judge texts by their merit, too, but I'm not sure that particular text has much merit. It seems to me that whether unemployment can be good is to some great degree a matter of numbers, and I don't mean anything so simple-minded as context-free consideration of the unemployment rate. What I have in mind, for example, is that if capital is not being shifted fast enough (from one kind of industry to another) to keep the unemployment rate "decently low" (low but not minimal), maybe something "not good" is going on. If you're OK with 6=5, ... :-) I used to be friends with a black brain-injured Vietnam vet who thought he was an angel (I almost thought he was, but that's a long story). He also thought that 1=0. The angel is fine with me. I also agree that it's about a number but the point is that the ideal number surely isn't zero and it is extremely unlikely that it is very close to zero, like 2%, too. The optimum unemployment rate in a society could be around 10% or so, depending on some details. One must appreciate that this figure also contains people who really can't work or won't work usefully anywhere. Every opinion that the right unemployment is a number well below 10% is probably an artifact of social engineering and brainwashing by left-wing propaganda. I am afraid that your "shifting capital" considerations suggest that you have completely misunderstood why unemployment plays such an important role - and perhaps, you haven't even read or understood the article you humiliated by the silly ad hominem attacks. The real reason why more-than-trace unemployment is good is that the employers have a sufficient bath of potential employees they can browse through and where they can quickly enough find what they need; and that the fear of unemployment creates an incentive for the employees to work more intensely, more reliably, and perhaps for less money. And because unemployment encourages self-employment which is a good thing, too. The reason why people don't get immediately re-employed to keep the unemployment rate tiny has nothing to do with the difficult to "shift the capital". It is indeed trivial to quickly move capital (one money transfer order with your bank is OK). What is not trivial is to change an individual worker's skills and expertise. A typical unemployed person can only do a small fraction of the jobs (among those he would accept). The elevated unemployment rate means that it's easier for the companies etc. to find new hires or replacement than it is for the unemployed to find a job and that's the beneficial inequality for the society because the failure of a company to fill the job can lead to problems for the whole company while the failure of an unemployed to find a job only brings problems to himself and/or his family if any. The former - company - is more important for the health of the whole which is why it's OK that in an optimum situation, a company spends less time by searching for a new hire than an unemployed spends by searching for a new job. Either one should be perfectly suitable as Leviathan's figurehead of "capitalism" -- functioning in reality as the opposite, of course. What a sweet gig that must be, controlling the manufacture and distribution of oxygen. So o.k., people like to make fun of the Swiss as boring, unexciting people. But their unemployment rate constantly hovers around three percent, and it is not artificially kept low by mortgaging the future through excessive borrowing. Their wages are among the highest in the world and the high price of their manufactured goods in the global marketplace has not hurt them yet significantly. There are some unique factors such as the legacy of past capital inflows due to banking secrecy (now being phased out) that could not be duplicated everywhere else, but maybe there are some things that the Swiss do right and that the rest of us would do well to study? Of course I read and understood the article. My complaint with it is that it's basically hand-waving, too vague, philosophical. Surely it is possible for unemployment to be either too high or too low to be optimal from the writer's point of view, if he had any idea of how to judge it, but he shows no sign of having such an idea. No, shifting capital is not so simple as making a bank transaction. The bank transaction is what happens after a process of decision-making, negotiating, etc. You talk about people who think - or "scream" - that the unemployment rate should be zero or near zero, but you offer no concrete, specific examples. I've known people like that, but without exception they are ignorant, and not all of them are socialists. The Fed's legal obligation to seek full employment does not mean zero or near zero, or at least the Fed has never interpreted it that way. The idea of frictional unemployment is fully recognized. As for types of unemployment which some might think unnecessary, such as structural unemployment, there's nothing the Fed could do about them, and this, too, is recognized. In the U.S., people who "can't work or won't work" are not classified as unemployed. I know you said "...usefully anywhere," but I your remark doesn't give me much confidence that you know how the U.S. unemployment rate is calculated. The U.S. Bureau of Labor Statistics calculates it from the so-called Households Survey (a joint project of BLS and the Census Bureau), which began in the 1940s. Nowadays the sample size is about 40,000 households. Of course, it is possible that some people who don't want to work lie to the survey, but if enough do so to make the unemployment rate far wrong, then there is no way to determine it, and we're talking about nothing. Dear Smoking Frog, I don't know in what sense the essay was "philosophical" - the word "philosophical" seems like a cheap way to talk the text down without any expectation that you would actually explain what's wrong with it. Whether it's philosophical or not, it contradicts the law making the Fed folks obliged to lower the unemployment. You say that I didn't tell you any examples of folks who scream that the unemployment rate should be as low as possible. Of course that I did. The people who wrote that the task for the Fed is to lower the unemployment are undoubtedly examples you claim not to exist, aren't they? Also, I don't understand why you include decisions about the shifting the capital to the process of the shifting capital itself. A couple may be deciding when to have a baby for 5 years which doesn't mean that they need 5 years to have a baby, does it? Concering the isolation of the people who won't work or don't want to work, you're surely joking if you are classifying this difficulty as a problem of my methodology, not yours or Fed's, aren't you? I never claimed that it is possible to strictly divide the unemployed people to those who are unemployed because they were unlucky or harassed etc. from those who are unemployed because they don't really like to work etc. It is you or the official statistical bureaus who claim such a thing - a fantasy - so it is *their* duty, not mine, to justify the implicit claim that this separation is any useful. For me, it is useless because it depends on subjective choices, empty excuses, and so on. It was clear from my text that I think that it makes no sense to try to divide the people to unemployed by their own fault or unemployed because of other reasons. One can only meaningfully and objectively enough count the total number of unemployed. At the same moment, it's clear that there are some people in this set who don't like work etc. I am not trying to quantify their precise number because I am confident that this exercise is silly and convention and emotion-dependent but I am sure that in any reasonable enough convention, the number is surely nonzero. ...but if enough do so to make the unemployment rate far wrong, then there is no way to determine it, and we're talking about nothing. Right but it's not my problem because I indeed agree that many of these quantities have so huge subjectivity, dependence on conventions, and error margins that they're useless. It's not my problem but it *is* a problem of the Fed because the Fed is legally obliged to pay attention to these meaningless quantities. that it was claimed to be between 2% and 13% depending on place and context. That's great but that U.S. unemployment rate was almost always in this interval so with this vague definition, it's meaningless to ask for the full employment. But the sentence in the law about the Fed was clearly not meant to be meaningless. It's meant to say that the Fed is expected to try to lower the unemployment to make it as low as possible. If it a codified rule that the left-wing opinions about the unemployment rate are the only right ones so the law is a partial codification of socialism in the U.S.; you haven't listed any reason to think that it's not the case. You are treating "unemployment as low as possible" as if it were commanded independent of anything else, and as if the Fed had the power to do more than influence interest rates. Both assumptions are incorrect. Secondly, It is not "socialism" to believe, as the Fed and many other people believe, that inflation and unemployment are negatively correlated. Here is the relevant section of the Federal Reserve Act. I think you'll see that it does not correspond with what you think of it. I'd like to write more, and I may, but I don't have time right now, and I'm thinking of refraining from provoking you further, anyway. Dear Smoking Frog, you're not provoking me much - quite on the contrary, I agree with you that inflation and unemployment are negatively correlated. That's another reason why higher unemployment is (also) a good thing. Socialism isn't to appreciate the correlation. Socialism is to prefer the government-engineered lowering of the unemployment to an ever lower rate despite this policy's bad implications for the employers and despite - as we now agreed - this policy's bad impact on the inflation.